Porsche GT3 gets Awesome Borla® Power Borla Performance shares a passion for performance with every Porsche enthusiast. They both consider quality a critical ingredient. The GT3 is certainly one of today’s super-cars. BORLA RD Engineers spent significant effort on the all new Cat-Back™ for this 996 GT3 hot rod. With performance gains considerably north of 25 ponies, BORLA has made their point. This power level is combined with a full stainless steel system exhibiting an expensive growl on acceleration yet a classy quiet at idle. The BORLA GT3 system (PN140252) incorporates two free-flowing mufflers and two tips per side with the 3.14” polished round BORLA embossed logo, adding a little more prestige to this luxury exotic. Borla and Porsche equal Quality and Performance…. 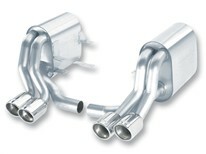 BORLA, the original pioneers of high quality, austenitic stainless steel (superior to 409 or aluminized steel) free-flow exhaust utilizes patented award and race winning technology to deliver quality, sound, performance gains and enhanced fuel economy -- all with an easy bolt-on installation. And backed by an unsurpassed written million-mile warranty.